Vietnam’s rich religious and cultural history extends for centuries and millennia, mixed with influences from China, the greater Indochina region, and Europe. In our search for examples of this mixed history, we find these influences concentrated in Vietnam’s diverse temple and pagoda collection. 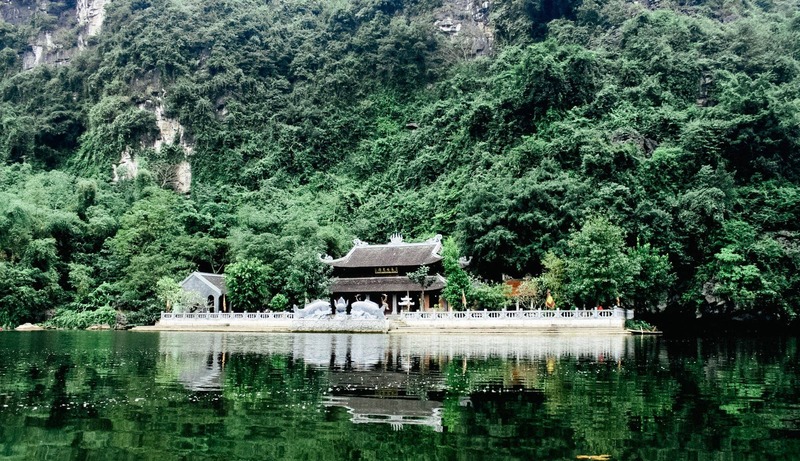 If you find yourself traveling through Vietnam’s countryside and provinces outside of of the urban centers of Ho Chi Minh City and Hanoi, we’ve put together a list of the most famous temples in Northern, Central, and Southern Vietnam to check out while touring what Vietnam has to offer. The temples listed here are some of the most famous temples in Vietnam. A pagoda located in the Huong Son commune near Hanoi, this Buddhist pagoda is considered by many to be the most important religious site in the country. You’ll find families coming to the pagoda to pray at all times of the year. You’ll find the pagoda located in the Ho Chi Minh Mausoleum complex, so there’s no shortage of other activities to do while you’re visiting the complex. Constructed in 1049 by King Ly Thai Tong, it was commissioned to be a token of gratitude towards Bodhisattva Avalokitesvara, a symbol of compassion that’s recognized among all Buddhas. After the construction of the pagoda, he married a peasant wife and had a son. The birth of his son was attributed to the success of The One Pillar Pagoda. Due to war, the pagoda was destroyed and rebuilt many times over the last 1000 years. In 1955, French Union forces destroyed the pagoda before withdrawing after the end of the First Indochina War. It was rebuilt soon after. Later, a replica was built in Ho Chi Minh City in the 1960s. There’s no admission fee and it’s located adjacent to the Ho Chi Minh Mausoleum complex. It’s definitely worth checking out if you find yourself in the area already. The pagoda itself is quite small so you’ll almost always find it overcrowded. Be prepared to battle through crowds to find a spot at the pagoda. With that said, it’s one of the easier iconic temples to visit, just located outside of Vietnam’s capital city Hanoi. I prefer the winter season, but you’ll have no problem visiting during the summer either. This temple is in the heart of Hanoi, you’ll have no trouble getting there. Considered among the three most iconic pagodas in Vietnam, the Perfume Pagoda is located 75 kilometers south of Hanoi in the Hatay Province. It’s one of the largest temple complexes in Vietnam. It’s a pilgrimage destination so you’ll find activities year-round. If you find yourself traveling to the Perfume Pagoda, make sure to bring hiking shoes. The temple is comprised of pagodas and Buddhist shrines that are intricately built into the limestone cliffs of Perfume Mountain, Huong Tich. It’s not your typical temple visit. The centerpiece of the Pagoda is the Perfume Temple. It’s located inside of Huong Tich Cave. Because it’s a pilgrimage destination in Vietnam, you’ll find it busy year round. In particular, you’ll find more visitors during the Lunar New Year so avoid traveling in late January to late February if you can help it. You can take a cable car up to the main sites or walk up. Because of the size of the complex and the two hour drive from Hanoi, be prepared to spend an entire day here. Depends on the size of your group. A bus for one or two travelers is more economical and efficient, but if you’re a larger group a private car to the area is well worth the extra cost. Be prepared to budget four to five hours round trip from Hanoi. You can also take a cab to My Duc, where you can catch a boat to the site. 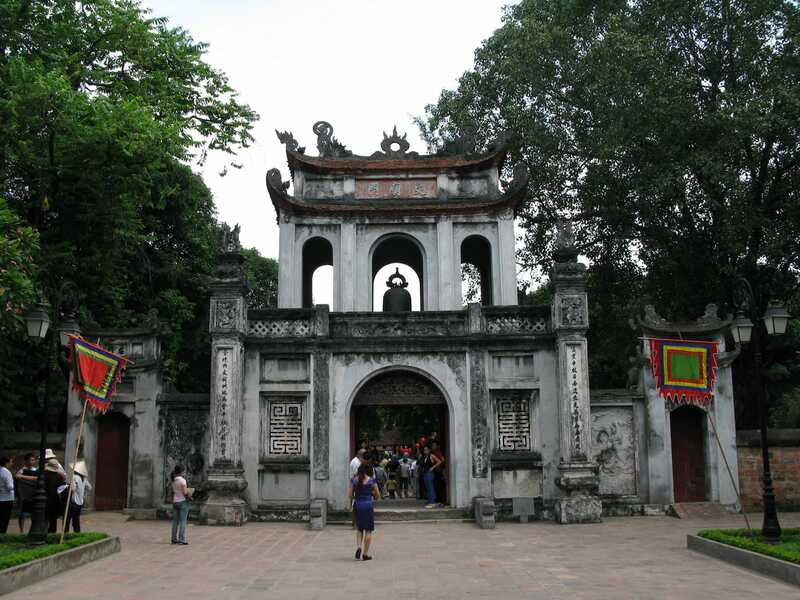 Home to Vietnam’s first university, hence the name, the Temple of Literature is a Confucian temple founded in 1070. It’s featured on the back of the 100,000 Vietnamese dong banknote. The architecture of the Temple of Literature dates back to the Ly and Tran dynasties that ruled Vietnam for more than 700 years, from 1076 to 1779. Inside the temple, you’ll find five courtyards. Some are resting areas resident monks and scholars. Another contains the Well of Heavenly Clarity. Here you’ll find 82 carved blue turtles inscribed with the names of the 1306 doctorate students that graduated from the university. The fourth courtyard contain altars of 72 of Confucius’s most decorated students. The last courtyard contains the Quoc Tu Giam, or translated into English as Imperial Academy. The university was home to some of Vietnam’s first educated noble and aristocratic class. One of the stone walls records the names of the 2,313 students graduating as doctor laureates, which is the most prestigious title given to students who passed the ancient laureate tests with the highest marks. It’s in the heart of Hanoi, you won’t have any trouble finding it. If you’re looking for a peaceful zen-like walk through the city, check out the Temple of Literature for an added cultural bonus. We suggest allowing 30 to 45 minutes to check out the entire temple area. Because it’s an temple in the middle of the city, we recommend grabbing a taxi or Uber to the site. Save your dollars for a more complex tour. 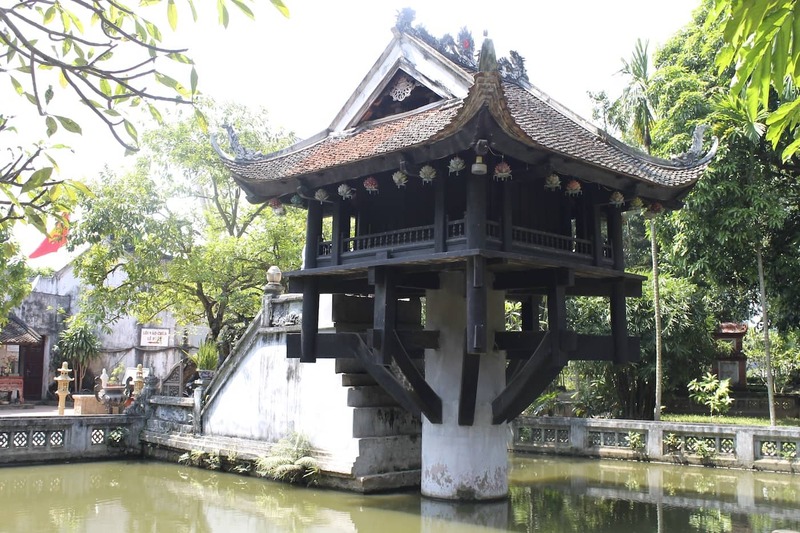 Found in Vu Thu District, Thai Binh Province of Northern Vietnam, the Keo Pagoda was constructed in 1061 under the Ly Dynasty near the Red River. It’s most recognized in Vietnam for hosting the annual Autumn festival which attracts nearly 30,000 visitors a year. Vietnamese legend explains that a fisherman in the 11th century achieved enlightenment as a Buddhist monk and gained the ability to fly through the air, walk on water, and tame animals. That man, Duong Khong Lo (1016-1094) became a Vietnamese legend when he used his newfound powers to save the life of the King, Ly Nhanh Tong (1066-1127) who was near death because of leprosy. To this day, the residents of the Vu Thu District in Thai Binh Province celebrate this fisherman turned monk with the annual Autumn festival held in September. The best traveling time to the Thai Binh Province is in Northern Vietnam’s winter season, from November to March. 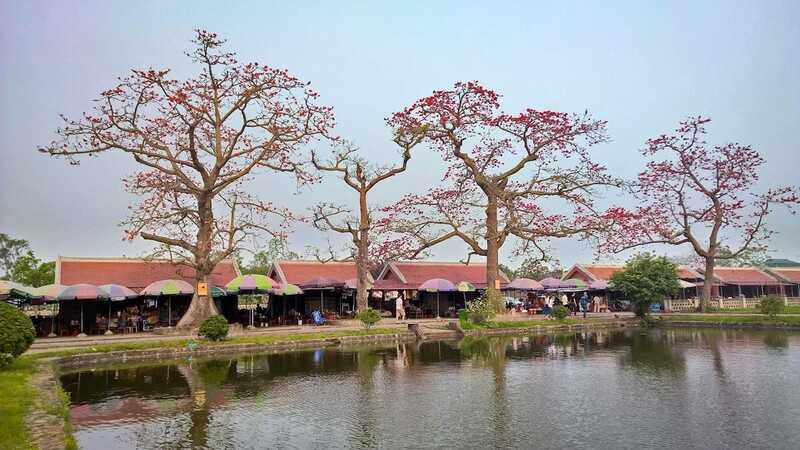 You can also travel in the summer when there’s more sunshine, but the heat and rain may slow down your trip to the Keo Pagoda. The best way to get there is by bus from Hanoi, then hailing a motorbike to navigate the area. Found just outside of the popular Central Highlands town of Da Lat, the Truc Lam Temple is a young Zen Buddhism monastery built in 1994. It overlooks Tuyen Lam Lake and is accessible by climbing 222 stone steps. In the private areas of the temple, you’ll find an area that houses about 100 monks and nuns. 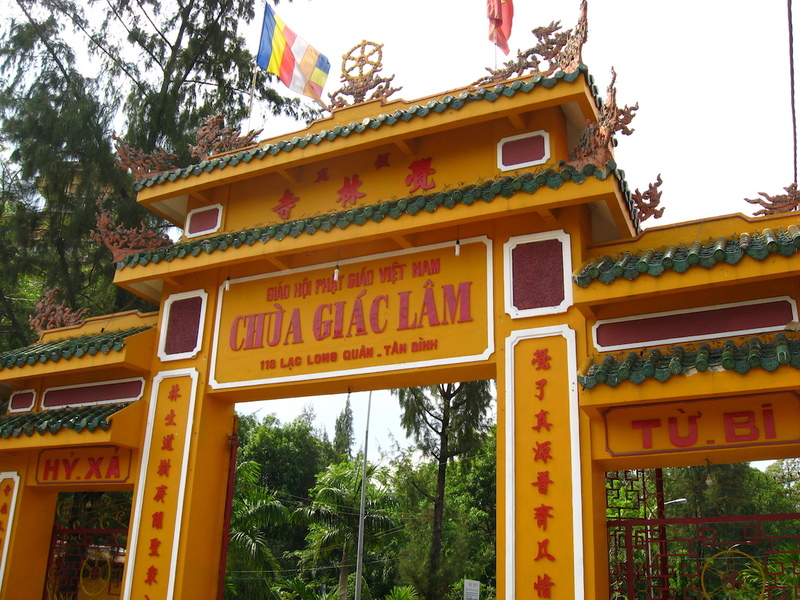 The Truc Lam Temple follows the new Vietnamese zen practice of Truc Lam. It combines three sects of zen that have come from China. This fusion Vietnamese zen practice was started by Emperor Tran Nhan Tong (1258-1308) who gave up his throne to travel throughout Vietnam as a Buddhist monk. The best traveling time to Da Lat to visit this temple is during Da Lat’s dry season, spanning from December to March to make sure you have a easy visit to the Truc Lam Temple. You can park your car or bike at the bottom of Robin Hill and take a cable car to Truc Lam Temple. A cable car ticket will cost about 70,000 VND roundtrip. A taxi back to Da Lat will set you back 100,000 VND. As with all temples, try to dress more modestly especially when in company of the monks. Location: Nguyen Dinh Chieu, Da Lat. Known for its zen-like atmosphere, the Yen Tu Pagoda is located on the Yen Tu mountain peak, overlooking lush forests below. It’s located between Hanoi and Halong Bay, 110km from the capital city and 50km from the UNESCO World Heritage Site. It’s a nice pitstop on your way to Halong Bay. There are cable cars that can take you up the mountain, priced at 280,000 VND for a return ticket. The best way to get to the Yen Tu Pagoda is by taking the Dong Trieu-Cam Pha bus to Uong Bi. You can let the driver know that you’re headed to Yen Tu, the price is about 20,000 VND per person for a drop off at the site. From the drop off point, you can take a taxi to the foot of the mountain. That will be about 100,000 VND for a 10km taxi trip. The cable car is 280,000 VND per person once you get to the foot of the mountain. 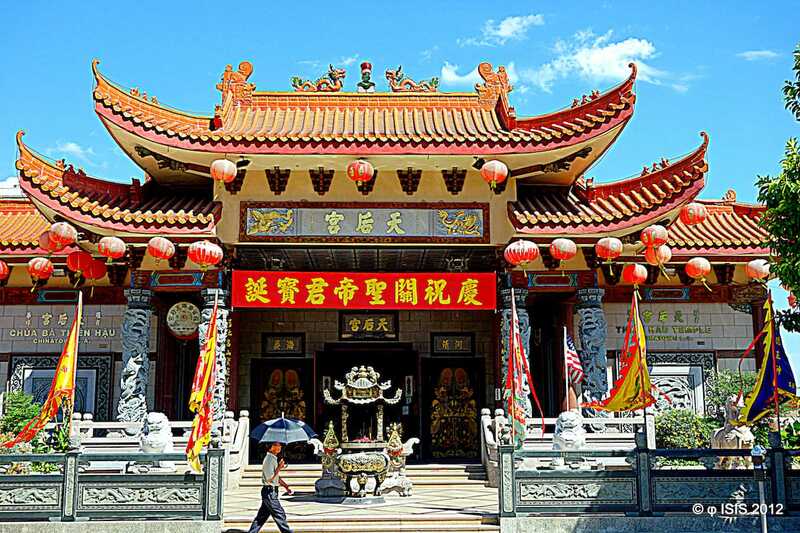 At the top of the Yen Tu mountain you’ll see the 100% bronze temple, known as Chua Dong. Along the path are plenty of places to eat and enjoy the view. At nearly every stop along the way are clean bathrooms for temple guests. 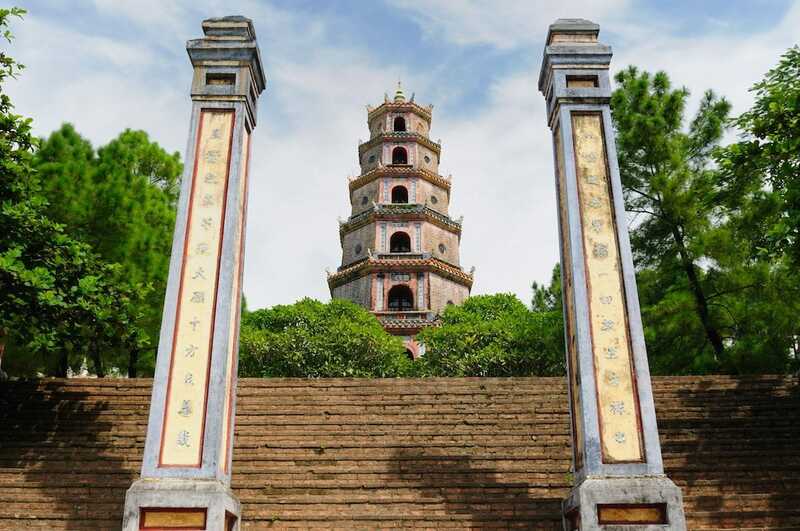 Located in Central Vietnam near the ancient imperial city of Hue, the Thien Mu Pagoda can be found on Ha Khe Hill on the left bank of the Perfume River in Huong Long Village. It’s just five kilometers outside from the center of Hue. The name of the pagoda translated into English means “Heavenly Lady.” Legend explains that an elderly woman told the local people that a Lord from the Nguyen Dynasty would come and build a Buddhist pagoda on the site of Ha Khe Hill. Lord Nguyen Hoang ordered the construction of the pagoda soon after in 1601, naming it after the elderly woman. Toward the end of the pagoda is a burial grounds for monks, designated by service and rank to the pagoda. To this day, it remains an active institutions for monks to study and live. The best traveling time to the Thien Mu Pagoda is during Central Vietnam’s dry season, from January to August. Visiting any other month will threaten your trip with flooding. Nearby Central Vietnamese cities like Danang and Hoi An will be impacted as well. In the dry season, it’s worth taking the boat to the pagoda from the city center. You’ll cover the whole grounds of the pagoda in thirty minutes. The easiest way to get there is to hail a taxi from Hue. You can also get there by boat from Toa Kham Boat Station. The fare for the boat ride is $10 round trip. A UNESCO World Heritage site, the My Son Ruins are a cluster of Hindu temples constructed sometime between the 4th and 14th centuries. They are now abandoned and unused, so you won’t see any active worshipping or religious visitors to the site. Due to war, many of the historical temples were partially destroyed or are currently being restored. There’s scaffolding in some of the areas that make parts of the ruins not as postcard-friendly. There are great views of the local mountains in this area. It won’t take you more than a few hours to tour the whole site. It’s also worth getting here as early in the morning as possible. The crowds will build up after the afternoon and the heat can get overwhelming as there is limited shaded areas in the ruins. 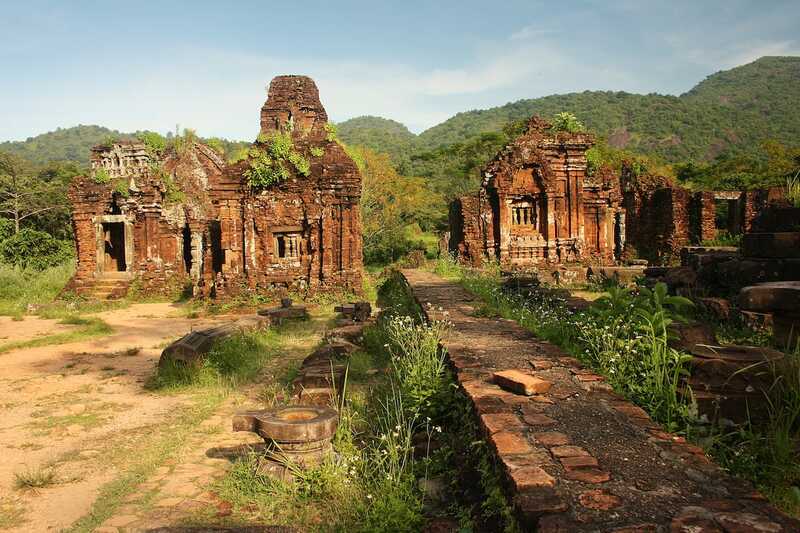 Located outside of Hoi An and Da Nang, the My Son ruins are accessible by car only one or two hours from the main cities of Central Vietnam. The Quan Cong Temple was established in 1653 as remembrance for a Chinese general with the same name. 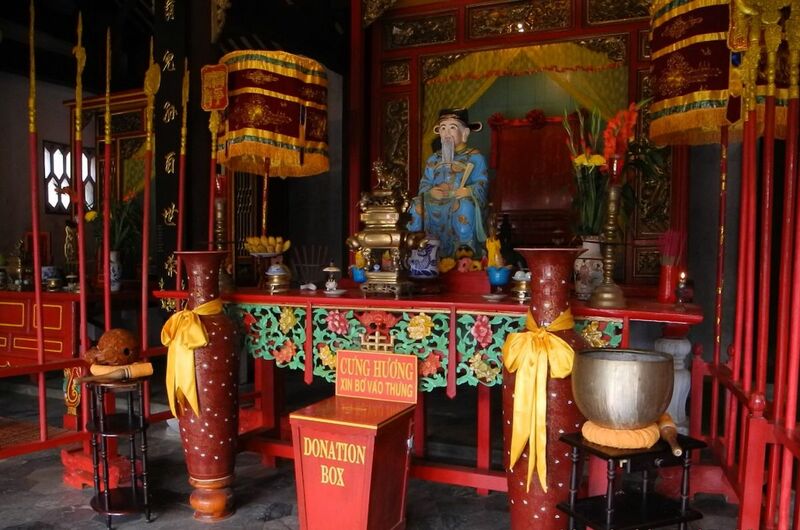 The architecture and style of the temple is Chinese, this type is common throughout Hoi An. From Danang, it’s about a 30-40 minutes taxi ride or a return journey on a shared limousine bus for 140,000 VND per person. If you’re already in Hoi An, the Quan Cong temple is located around the Hoi An ancient town so it’s not too troublesome to get there. This temple is a bit crowded given its convenient location, so be sure to purchase a ticket for entry in advance. Depending on the weather I would recommend bringing water, sunscreen, and a hat given that there’s little shade and a somewhat large temple to walk around in. Remember to dress in appropriate attire to be allowed admission. 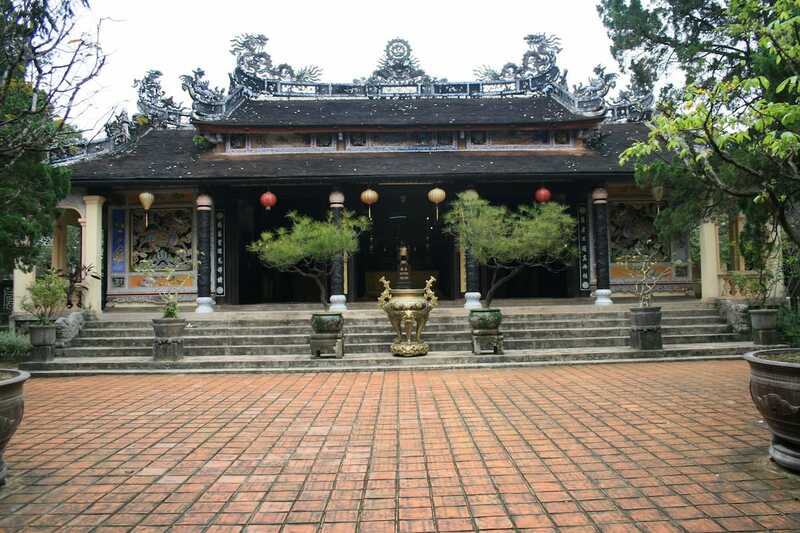 The Bao Quoc Temple is famous for its monk training center. It has been operational since 1940. The pagoda itself was founded in 1670. You can’t miss it – it has a triple-gated entrance that pops out visually. Despite a few renovations, the temple has been able to keep its charm. The temple’s courtyard is surrounded by balconied buildings and stupas built in honor of Buddhist figures. 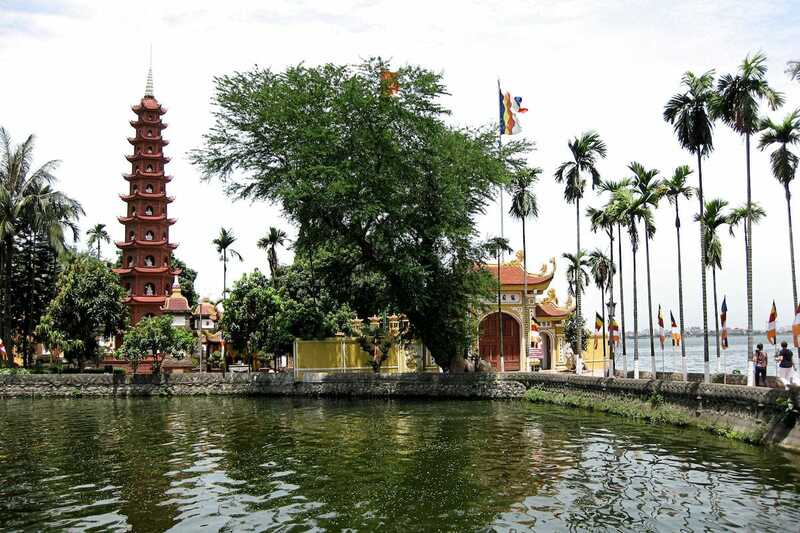 The Bao Quoc Pagoda is open from sunrise to sunset. It’s located on Ham Long Hill, just a kilometer of Hue’s city center. It’s located on a street that bears the same name, on the south side of the Perfume River. 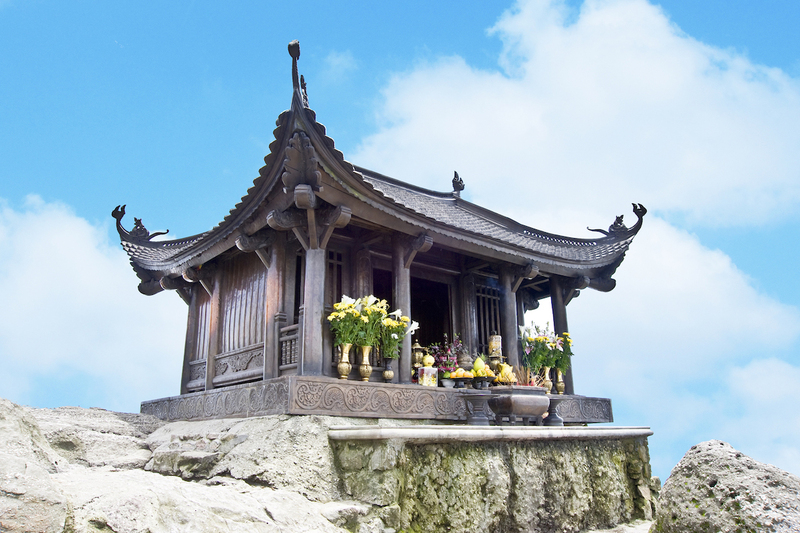 Located on a hill, the Linh Ung Temple overlooks the sea. It’s position in the city is historically significant because the pagoda is meant to protect the city and its people. The temple grounds are filled with foliage. Her symbolism represents compassion and motherliness in Vietnamese tradition. The view is stunning, especially during sunrise and sunset. You’ll get a view of Da Nang City and the ocean. Located near the city center, it’s not too challenging if you want to catch an early morning glimpse of the area. 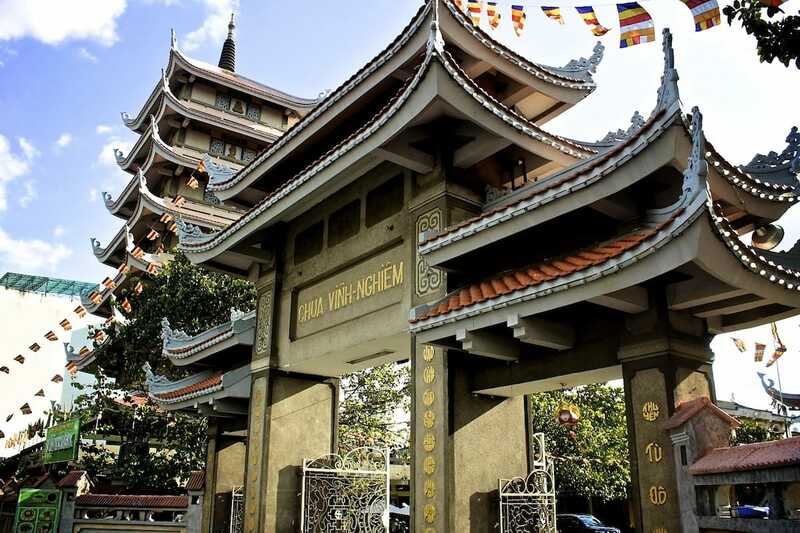 Built in 1843, the Tu Hieu Pagoda today hosts 70 resident monks. You can hear their chanting daily at set intervals, starting at 430 in the morning until 1900 in the evening. 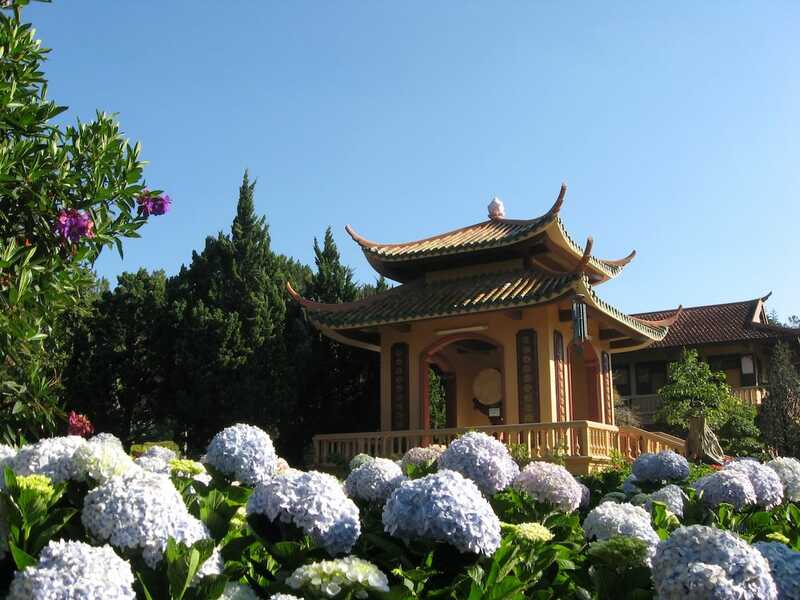 Set in a garden area and pine forest, this pagoda is ideal for a zen-like getaway from the city. Tu Hieu is recognized globally for hosting Thich Nhat Hanh, one of the leading voices of international Buddhism. He entered the pagoda as a resident monk in the 1940s and by the 1960s, he became one of the most active Buddhist influencers. He studied and taught in the United States and lobbied the government to end its Vietnam War effort. Located only 5km from Hue’s city center, it’s easily accessible for travelers who already in the city. 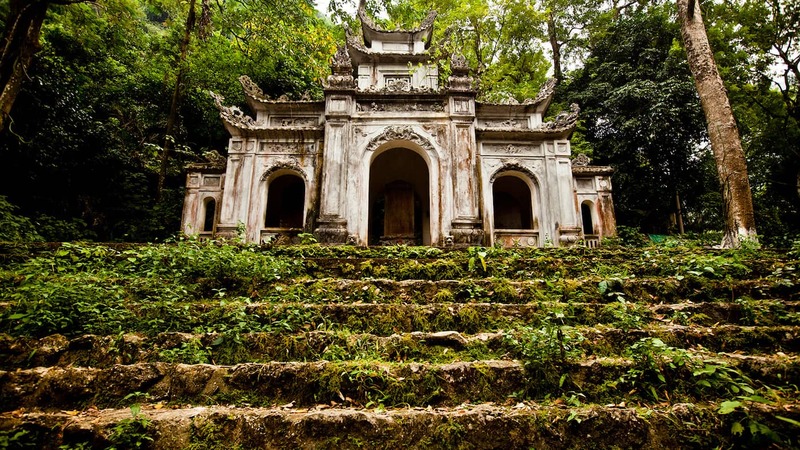 The Tu Hieu Pagoda, for its historical significance and zen-like atmosphere, makes it one of our favorite sites to check out in Central Vietnam. 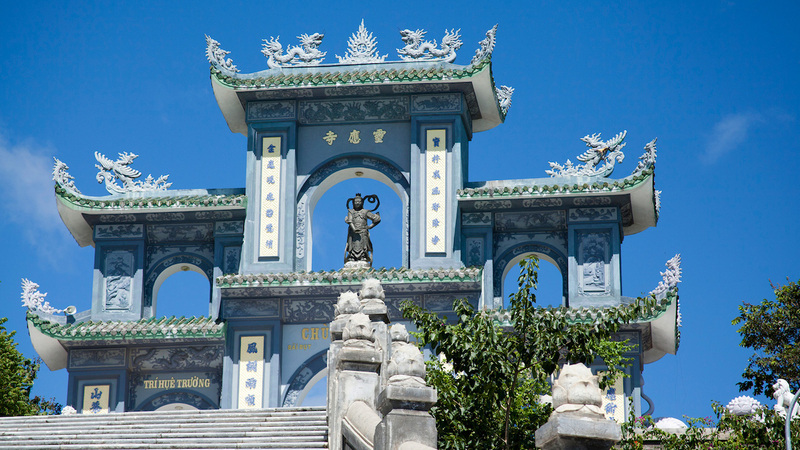 Most pagodas in Vietnam are made out of natural materials, but the Vinh Nghiem Pagoda is the first temple in Vietnam to be constructed using concrete. As a Mahayana pagoda, the dominant form of Buddhism in Asia, it’s religious purpose is to provide a place for worship for Gautama Buddha and two bodhisattvas, Manjusri and Samantabhadra. If you’re looking for a meal, look no further than Cuc Gach Quan. A short 10 minute walk from the Pagoda, you’ll find one of the top-rated meals in Ho Chi Minh City. Given that it’s towards the direction of the airport, it’d be a good spot to stop before heading out for a flight. It’s right outside the city center, we recommend taking a cab or Uber to the site. This temple is open from 8am to 5pm everyday, except during the Lunar New Year when the temple closes a bit earlier. Located in the dead center of Cho Lon, the Chinatown of Ho Chi Minh City, the Thien Hau Pagoda is a Chinese-style temple dedicated to the Chinese sea goddess Thien Hau, or Lady of the sea. Originally constructed in 1760, it has undergone restorations on a regular schedule. Given that it’s a regularly used temple by locals, there will be a flow of smoke and fragrances. If you’re allergic or sensitive, you may want to consider staying away from the main altar area. The highlight of the temple for the Vietcetera team are the dioramas on the pagoda’s roofline. If you find yourself in Chinatown, you might as well make the temple as part of your visit to Ho Chi Minh City. The nearest attraction near the temple is Binh Thay Market, also in the Chinatown area. The Cho Lon area is quite large, before 1931 it used to be a separate city from Saigon. As the cities grew and borders merged, the government brought the two cities together. Arguably the most famous temple in Vietnam, the Jade Emperor Pagoda was most recently in the news after American President Barack Obama visited the site on his state visit to Vietnam in May 2016. Unlike many old temples in Asia or Vietnam, this temple is vibrant and active with locals presenting offerings and praying at the many shrines here. It’s a refreshing experience to see active, local worship at this pagoda. There is an atmosphere of respect, humbleness, and patience at the temple. A place where locals can worship and reflect. Despite its newfound fame with President Obama’s visit, there was nothing commercial or touristy about the pagoda. True to its name, the temple is decorated with green ceramic tiles and dragons on every corner. There’s an area cordoned off at the temple for sacred turtles. They are considered symbols of good fortune in Vietnam. 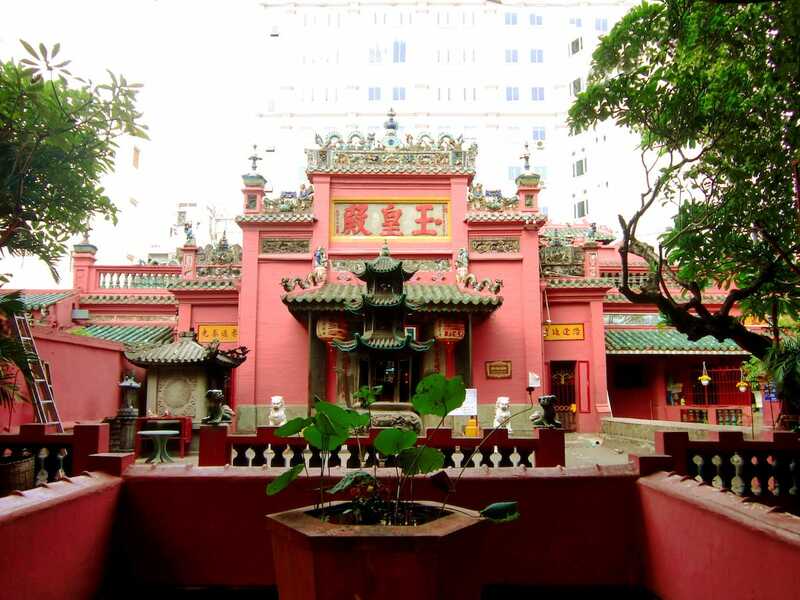 The Jade Emperor Pagoda is located in the sleepy, residential Dakao ward within District 1 of Ho Chi Minh City. Here you’ll find some gems, like Cuc Gach Cafe, Bunker Bed & Breakfast, and the Vintage Emporium. Don’t miss them! 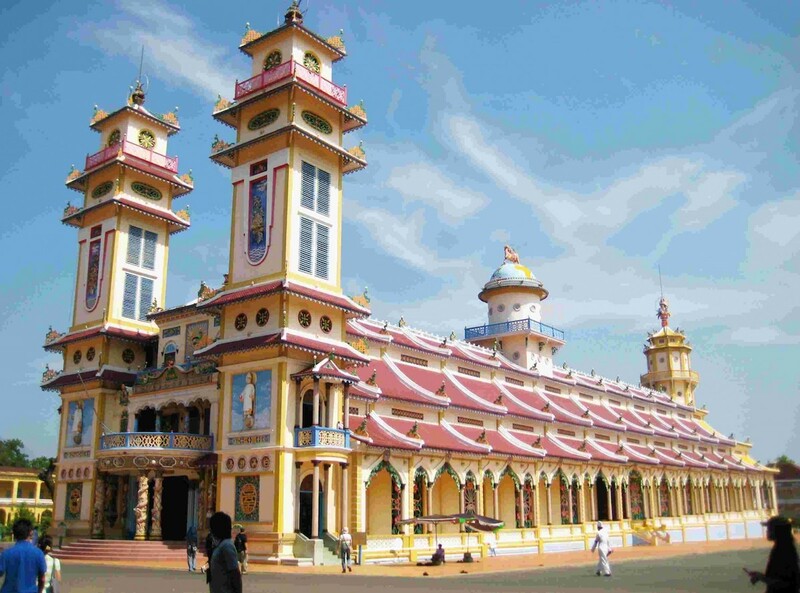 Located in the Mekong Delta region, the Vinh Trang Temple is arguably one of the nicest temples in Southern Vietnam. The architecture and colors instantly pop out and are unique compared to other temples that you’ll find in Vietnam. 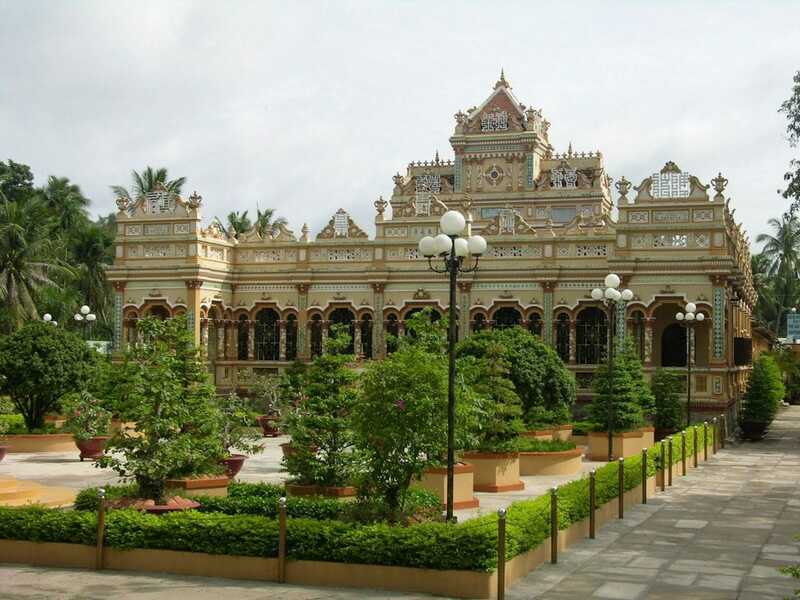 The Vinh Trang Temple resembles an Indian Raj Palace, restored overtime with decorations of mosaics made from broken pottery. Set among huge Buddha structures, one laughing and reclining version and another lifesize sitting Buddha, and gardens filled with lotus pools and flowers, the Vinh Trang Temple is also home to ornate arched gates and tombs of the monks that lived here years ago. Entrance to the Vinh Trang Temple is free. The easiest way to get to My Tho is by bus or motorbike from Ho Chi Minh City. It’ll take around three to four hours, so make sure to budget time for a day trip, or better yet make it as part of a multi-day tour of the Mekong Delta region. Cao Dai is a Vietnamese religious movement started in the 1920s. It incorporates Buddhism, Taoism, Confucianism, and even Catholicism. The temple itself was built sometime between 1933 and 1955, using influences from cathedrals in its architecture. You’ll notice that there are square towers and a long central pathway in the hall with side aisles. The building is extravagantly decorated compared to other temples in the city. Located in a district outside Ho Chi Minh City, it’ll take you nearly three hours to get there. Plan to make a whole day out of it and the surrounding area, given that the temple only takes thirty minutes at most to explore. We suggest checking out the Cu Chi Tunnels since it’s in the same direction. If you’re in a group, you’ll be better off exploring the area using a private cab to save time and be a bit more comfortable. Built in 1744, the Giac Lam Pagoda is one of the oldest pagodas in the city. It’s undergone significant renovations twice, modernizing with the times each renovation. Despite its urban location, one of the first things you’ll notice about the pagoda are the expansive grounds that it sits on. One of the landmarks in the complex is a seven-story stupa that is accessible to visitors. You can climb up and get a nice view of the city. It’s located a bit far out from the city center, so budget at least 25-30 minutes to get there by taxi. I would budget at least an hour to check out the whole grounds. You should also note that given its location outside of the city, it’s more of a local worshipping grounds rather than a tourist pagoda. You’ll see more local amenities and appeal, rather than traveler appeal at this location.